With the success of her critically acclaimed book, The Hate U Give, Angie Thomas has been very busy promoting her movie adaption of the same novel and her upcoming new book. She spent last week, though, speaking to Murrow students. 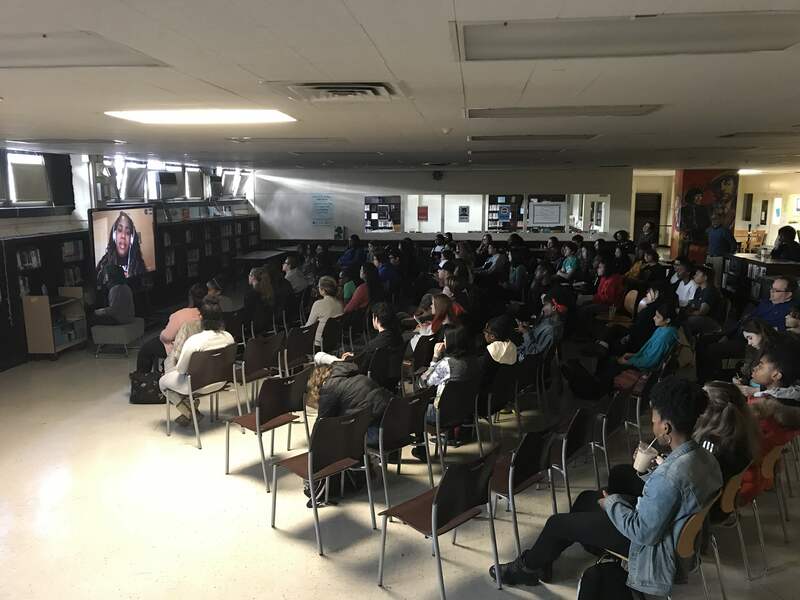 Thomas, 31, spoke about her experience being a writer, and answered questions addressed by Murrow students through Skype in the library. She also spoke about why she wrote the book, and how characters from the book were inspired by real people, including herself. Thomas was born and raised in Jackson, Mississippi, where she experienced many similar things that the main character of The Hate U Give, Starr Carter, experienced in the book. Many people at her primarily white school judged her because of where she lived, and she let it define her, until the murder of Oscar Grant. The shooting of unarmed black man, Oscar Grant, Thomas said, made her have a voice. This inspired her to write The Hate U Give, which started out as a short story, but then morphed into a novel after she realized she wrote too much for a short story. “Why are you doing that?” said people from Thomas’s neighborhood after she told them that she was going to attend the predominately white school, Belhaven University. These macroaggressions cut deep, but she did not let them define her, she told Murrow students. She knew that people were insecure that they were not going to college, so she did not let their judgments get to her. One controversy she addressed was the casting of Amandla Stenberg as Starr. Many people reacted negatively to the casting of Stenberg, saying that Stenberg did not look like Starr on the cover of The Hate U Give. Starr’s skin color on the cover of the book was darker than Stenberg’s skin color, making people think that the studio was whitewashing the movie. But throughout the conference, Thomas continues to stick to her message of stopping racial injustice.